Known elsewhere as the piledriver; the Tombstone version of the move is most commonly used. 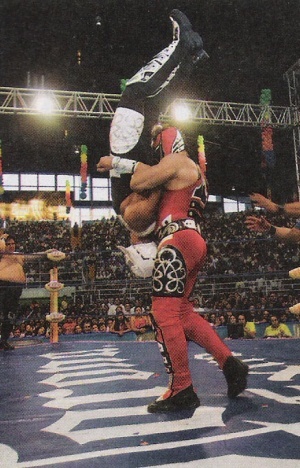 Universo 2000's sit down version is known as the Black Hammer. These moves are illegal in standard lucha libre matches. Martinetes were originally banned for safety reasons, after a wrestler was paralyzed receiving one. The intention of the rule seemed to ban all piledriver variations, ending a match in a disqualification immediately after use. Over time, this banishment has been reduced to just banning the two moves pictured on this page. Other piledriver variations or moves with similar potential for neck trauma are allowed. The rule isn't forgotten or ignored, as questionable moves usually lead to debates between the announcers over the move's legal status, but the ban has evolved into less of a safety concern and more of a unusual match finish. Martinetes are essentially more impactful versions of fouls, with the victim usually being taken to the back on a stretcher and possibly missing a few weeks of action. There's no more powerful move in lucha libre than a martinete. Unlike fouls, if a wrestler manages to execute a martinete without the referee(s) noticing, the attending representative of the local Box y Lucha commission may overturn the referee decision and rule a DQ due to the level of offense.